Pilots need perfect visibility in all their instruments. It is critical to be able to tell at a glance exactly what is going on at any given moment and they don't need anything that complicates the situtation. We have carried the traser watches for years for just such a reason. 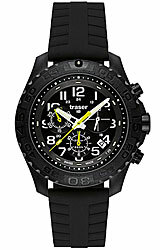 Now, the all new Traser Outdoor Pioneer Chronograph takes that to the next level. Simple to use chronograph, high contrast dial and Tritium illumination check all the boxes but this watch has an all new trick... Tritium illuminated date window! 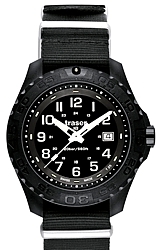 This is the first watch available from Traser to feature a fully illumated dial which includes the date window. So now the hour hand, minute hand, second hand, 1-12 markers, rotating bezel marker and date windown are fully illuminated for perfect night visibility. It's the perfect watch for any situtation.